Samuel Beckett has been described as an Irish avant-garde novelist, playwright, theatre director, and poet known for his use of dark humor, absurd situations, and extreme precision in his writing. The second stage production of Stanford Summer Theater 2013 is Beckett’s Happy Days, a play that’s billed as a comedy “unparalleled in its comic precision and deep humor.” Some may quibble with that description, but for Beckett aficionados this is a “not to be missed” production. For those not so enamored, it could make for a very tedious evening. When Beckett was asked what went through his head when he wrote Happy Days, he said that he imagined the worst thing that could happen to someone was to be perpetually deprived of sleep. He further painted the visual image of someone simultaneously sinking into the ground, being eaten by ants, being stuck under an unremitting blazing sun, possessing only the sparest set of belongings, and through it all remaining happy in life. He saw this as a metaphor for the plight of the modern woman, and this graphic description is the physical picture (sans the ants) we see at the top of the play when we meet Winnie (Courtney Walsh), our protagonist. Within Winnie’s reach are a few possessions. To her left lies a capacious black shopping bag containing a number of personal items such as a toothbrush, toothpaste, and reading glasses. To her right lies a parasol. After being jarred awake by a deafening ringing bell, she begins an interminable monologue broken only rarely by her unspoken thoughts and by Willie (Don DeMico), her husband, who is behind the mound in which she is ensnared. He sleeps, and occasionally he wakes, but for the vast majority of the play his presence is merely implied. Winnie blathers on musing about her state of being for quite some time, as she attempts to read the writing on her toothbrush, cleans her reading glasses, and fusses with a few other belongings. She eventually spots an emmet (an archaic term for an ant) crawling nearby. After pulling a magnifying glass from her bag to get a better look, she describes it to Willie in exquisite detail. Willie exclaims “FORMICATION!” in response to her description causing them both to burst into laughter. This is one of the few moments that can garner a chuckle from the audience during the performance. While written in two acts, the 85 minute play is performed without an intermission. The main curtain closes briefly at the end of Act 1 to facilitate a very quick scene change. For the much shorter Act 2, Winnie is repositioned into an even more absurd circumstance. The set is sparse and with its cast of two, the production fits well into the black box Nitery Theater. 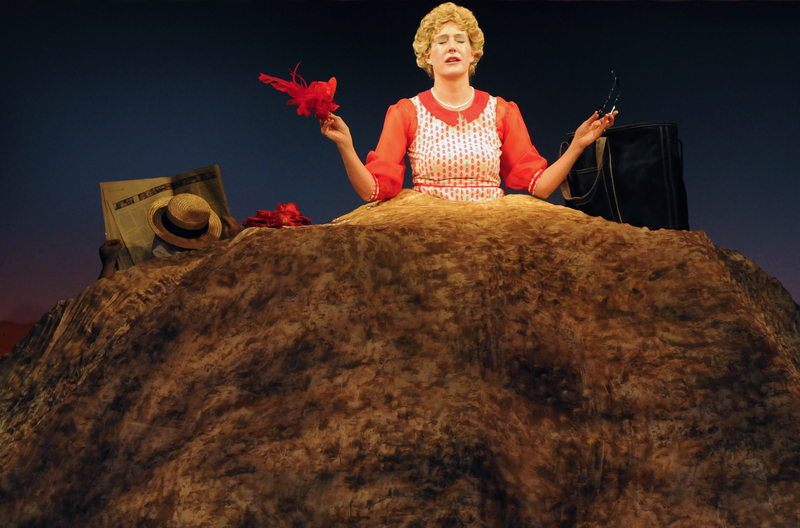 Center stage, we find Winnie buried to her waist in a giant mound of earth. Her accoutrements are within easy reach on either side atop the mound. The lighting is very bright for the majority of the performance, only dimming for a few brief moments. The sound effects are sparse as well, and the most noticeable one is the aforementioned clanging bell anytime Winnie’s eyelids fall. SST’s artistic director Rush Rehm stays true to Beckett’s purpose. In addition to the copious amount of stage direction and description in the script, he and Walsh studied the playwright’s personal notebooks to ensure their interpretation was exactly as Beckett intended. Walsh embraces the tour de force role bringing verve and polish to her portrayal. Every movement is dictated forcing an almost mechanical precision to each motion down to changes in facial expression, and Walsh’s execution is genuine. She affects a very believable Irish brogue with clear diction and a lyrical cadence, which is all the more impressive given the dental appliance she wears through the performance. Walsh keeps up the patter quite naturally even in the midst of the physically improbable situation. Any time Winnie appears to be near sleep, the lights shift, the bell clangs loudly, and Walsh’s eyes widen as she snaps to attention. DeMico complements Walsh during those rare moments when Willie is present. He has few lines, but he is crisp in his delivery, and he is appropriately tentative when he eventually comes around the mound. In a lobby discussion following the opening night show, Rehm noted that he admires the way that Beckett explores two mutually exclusive philosophical positions in all of his work. On the one hand, Beckett acknowledges the philosophy of Heraclites which points to ever-present change in the universe. In Happy Days it is hinted at by several repetitious phrases delivered in subtly different contexts throughout the story. On the other hand, Parmenides of Elea’s contrasting philosophy that change is impossible simultaneously rings true in the repetition and thematic consistency. As to the precision of Beckett’s writing, Rehm equated that to an atonal musical composition claiming Beckett’s word choice was often based on the sound of the word even more than the meaning. Rehm’s description brings to mind the question of tonality when the play is performed in French as will be the case when this production goes on the road to France later this fall. Audience reaction to this production is varied. Some members of the house sit wide-eyed, in rapt attention, and hang on every word. Others fall asleep, and opening night, some snoring was heard at times. Going back to Beckett’s original discussion of this play, he is reputed to have told his cast that if some audience members walked out in the middle of the show, they’d done their job well. While watching the play isn’t as painful as reading it (which I did in preparation for reviewing it), it’s not a play that I find easy to sit through. It’s also worth noting that at the Nitery Theater, ingress and egress are not permitted during the performance, so consider yourself forewarned. Info: See sst.stanford.edu or call 650-725-5838.
and i can think you are knowledgeable on this subject. feed to keep updated with coming posts. Thanks a million and please continue the rewarding work. Hi! I’ve been following your blog for a long time now and finally got the courage to go ahead and give you a shout out from Huffman Texas! I had to review the post two times to see to it I understood everything you were stating. I understand … silly me. I entirely agree. Regrettably the majority of individuals will not even pay this much attention because they have their own agendas. I’m not sure how a quit snoring website would have anything in common with theatre reviews and commentary, but sure, go ahead.